Supermarkets in China (and where not) have been unfriendly for innovation – to put it mildly. 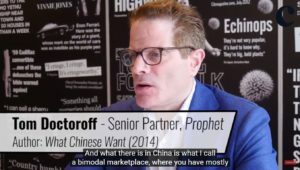 But Alibaba‘s HEMA’s supermarkets, starting the so-called “new retail”, are causing a revolution, writes marketing guru Tom Doctoroff in AdAge. 25 Stores are functional and dozens more will be open soon. Until recently, China’s grocery retail scene was primeval. Customer service was an oxymoron. A walk down the aisles of locally managed chains such as LianHua, HaiHang and Bubugao is a depressing experience, with ultra-bright lighting, wilted produce and scowling employees. Due to operational rigidity and cultural tone deafness, no international hypermarket—Carrefour, Walmart or Tesco—has achieved broad scale. Hema, on the other hand, oozes customer-centricity. In-store restaurants build a sense of in-store community. Layouts are easy to navigate and address Chinese sensibilities—for example, live produce is put near the entrance. In the U.S., the closest equivalent might be Whole Foods, though it’s worth noting that Alibaba debuted its Hema brand before Amazon bought Whole Foods. Traditional retailers haven’t tried to create an emotionally appealing brand, while Hema has. The brand name Hema Xiansheng means “boxed/packaged freshness and liveliness,” while it also sounds like the phrase “Mr. Hippo.” Hema uses a personified hippopotamus as its mascot. Its advertising is also more adventurous than other supermarket brands. Hema had a pop-up “Seafood Art Exhibition” in Shanghai, in an aquarium-style glass house, where consumers could check out expensive seafood products such as Boston lobster and Alaskan king crab. What will make Hema resonate? For one, it provides multi-level reassurance. China is the ultimate low-trust society. Economic, social and political interests remain unprotected by impartial institutions. Food, specifically, is dangerous stuff. The fear of contamination has been acute since 2008, when six babies died and several hundred fell ill from tainted milk powder. Parents pay 300 percent premiums for imported infant formula. In this context, Hema’s transparency is manna from heaven. QR code displays reveal the origin of every product—where it was made, where it’s from—as a guarantee of quality. The Hema purchase process also introduces new levels of “seamless product trial.” Rather than piling goods into a cart and handing over cash over to a surly worker at the cash register, shoppers can “graze and pay” as they go. Imagine a woman enticed by a tropical fruit she may serve at a dinner party. With Alipay, she can buy just one, take a bite, and buy ten more later if the product passes muster. Or she can order online for delivery just before the event. Finally, the supermarket opens new worlds of discovery. Hema’s multidimensional online-and-offline experience turns shoppers to connoisseurs of the exotic. Buyers are instantly provided information about, say, a novel dessert’s provenance or recipe ideas for unusual seafood dishes. In China, a nation obsessed with sending pictures of food through cell phones, culinary adventurism is tantamount to lifestyle elevation. Given the ubiquity of social media platforms WeChat and Weibo, cuisine is translated into “face”—that is, currency of social advancement. “Showing you know” is a weapon in China’s competitive battlefield of life. Tom Doctoroff is a speaker at the China Speakers Bureau. Do you need him at your meeting or conference? Do get in touch or fill in our speakers’ request form. Are you looking for more marketing experts at the China Speakers Bureau? Do check out this list.